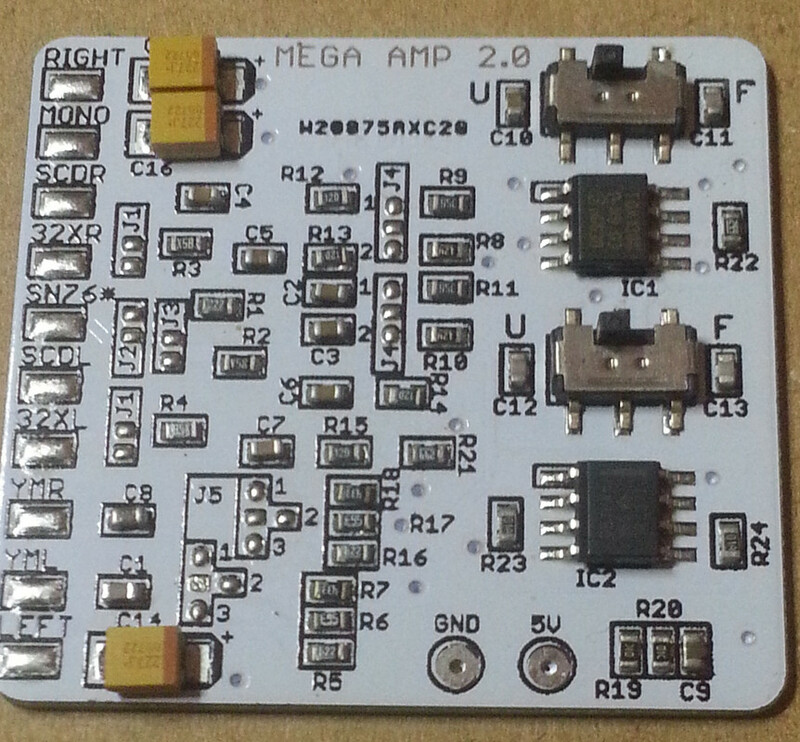 Up for sale is the Mega AMP 2.0 Mini designed by ACE and villahed94 and PCB made by myself. For more info on this mod go to the thread to read up on it, this board has some solder jumpers to choose the proper filter for all compatible mother board and Model versions so one board can be used on multiple consoles (if you need to transplant it on another console for example). There are also 2 switches for Filtered or Unfiltered sound so the end user can change it on the fly, both switches need to be set to U or F. Also this version of the board does not have the Sega CD Pass-through, you will need the Pro version of the schematic (no one has made this version board yet) or make a separate circuit based on the schematics provided by ACE. $25 for the board and $5 Shipping Worldwide. I can provide install service for people who can't or don't want for $50 (parts and labor) plus shipping of the system if you live in USA since shipping is expensive outside USA. Last edited by Helder; 04-20-2018 at 11:07 PM. Hey helder hows it going? still waiting on that variable mega drive model 1 overclock your working on. just wondering if any progress has been made. Can I use this on a VA2 MD1? Not really the thread to ask this as it's another project but no nothing has been done, the MD2 mod should work on the model 1 but you will need to do a wire install using that board. It should work on any MD1 and MD2 but I'm unsure of the solder locations on the MD1 models besides the VA7. This is great Helder - thanks so much for making this! What are the dimensions of it? I'll have to pick one up as soon as I finish my other project. The size is 1.50x1.39 inches so it's even smaller than the older Mega Amp boards I sold and the output is alot nicer too with the tantalum caps on the output. Just wanted to say I got Helder to install a Mega Amp 2.0 mini in my Model 2 VA0 Genesis the sound is incredible. He also added a region switch and Blue LED which are great. He is a real good guy responded to any questions promptly and did the work and return shipping way faster then I was expecting. Hello I recently bought this board but can't find any installation diagrams for my Genesis model 1 VA2. Can anyone help? Yes they are and for @Cargo please read the first post of this thread, it clearly says which models this is for and that is not one of the models so I have no wiring diagrams for it. Helder, I installed the mini, my VA7 model 1 sounds way better, but I feel the bass doesn't have enough *oomf* to it, and I feel the sfx in Sonic 2 are a tad louder then the music, my VA2 model 1 system seems to not have the sfx that loud. We're there any differences in the VA7 model 1 installation diagrams, or jumper settings on the board, from when Ace discovered some issue a few weeks ago? And one last thing, does this installation remove the volume slider function on the stereo jack model 1's? Cause where I soldered the wires for headphone left & right, it's full blast. (I use euro scart and need audio output from my headphone jack) if this does not remove the volume slider function, is there any schematic/diagram that shows the exact spot on where to solder the 2 wires? Thanks! Try running your Mega Amp on a filtered setting, that might give a bassier sound. I never did care much for unfiltered FM sound personally. The PSG volume can be reduced slightly by changing the 2.2K pull-down resistor for the PSG to a lower value. Try 2.0K or 1.8K. Last edited by Eep386; 11-11-2017 at 10:58 PM. Thanks for replying! I've definitely been using the filtered option of the mega amp 2.0 mini. I'm not following you on what you mean by "try 2.0k or 1.8k." I don't know what you mean. I've followed all the VA7 installation diagrams as described. I work better with visual aid. The headphone slider id really like to have back working. Another site said I need to cut a trace on the VA7, but I don't know where, and I'm hesitant without, again, some sort of visual aid. What you will need is one 2.0K or 1.8K ohm 0805 SMD resistor to put on the PSG pull-down. 1.8K will give a quieter PSG than 2.0K, but both will be slightly quieter than the 2.2K used by default. Unfortunately, Helder's boards don't appear to follow the same references as Ace's circuit schematics, and judging by the pictures provided here Helder coated the traces of his latest batch of Mega Amp boards with paint, so I can't ascertain where exactly the PSG resistor is on it. A hunch says R1, as it's closest to the PSG input pin. Last edited by Eep386; 11-13-2017 at 01:40 PM.